This Christmas, beloved characters from Disney and Disney-Pixar, including Mickey Mouse, Cinderella, Elsa and Woody are celebrated along Singapore’siconic shopping belt, Orchard Road. This is Disney’s largest Christmas street Light-Up in Southeast Asia. 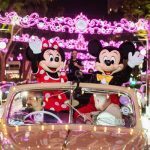 Organised by Orchard Road Business Association (ORBA), “Disney Magical Moments” runs from 10 November 2018 to 1 January 2019, where the 2.88-kilometre stretch of Orchard Road transform into four distinct zones decked in different Disney themes – Disney Princess, Mickey Mouse and Friends, Frozen and Toy Story. A glittery main arch featuring selected 3D Disney characters at the Orchard Road-Paterson Road junction is the centrepiece this year. 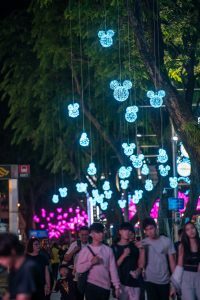 A dazzling display of lights lined Orchard Road, with trees on either side decorated with illuminated 3D Mickey Mouse icons. Hanging over-street lights also include iconic elements in its design – for example, the apple from Snow White (Disney Princess) and the Mickey Mouse glove (Mickey Mouse and Friends). Visitors will also be treated to Instagram-worthy opportunities of life-sized set pieces featuring iconic Disney characters. Two malls — Orchard Central and Wheelock Place — will also be decked in Disney-themed decor. The “Disney Magical Moments” campaign with ORBA is part of a three-year collaboration between Singapore Tourism Board and The Walt Disney Company Southeast Asia (Disney). Hitachi Asia Ltd, the main sponsor for the annual light-up event for 28 years, returns as the Main Sponsor. In addition to the street light-up, The Great Christmas Village returns for a longer run at Ngee Ann City Civic Plaza in its second year. Running from 15 November to 26 December 2018, it features an array of exciting activities suitable for all ages, including Singapore’s first duplex carousel. Christmas pop-up stores will also return with experiential shopping experiences for shoppers at Orchard Road.